Consider this, by 2017 e-commerce sales in US alone is expected to be around $434 billion. Thanks to the rising popularity of mobile and increasing internet penetration, e-commerce is the way forward for businesses across industries. But for most businesses this can be a huge decision to make – they not only have to invest time and money but also decide between options like adopting an e-commerce store, selling through existing online portals (marketplaces), or both. In this blog, we will quickly compare an e-commerce store and online marketplaces and look at how a New York’s leading dealer for DJ, Pro Audio equipment, Music Technology and Instruments leverages their e-commerce store and the online marketplace to increase its brand presence and improve sales. A marketplace is a multi-vendor online store that enables consumers to shop for a variety of products and brands from multiple vendors across multiple locations. Marketplaces make it convenient for businesses to list and sell their products by taking care of all the operational aspects (from providing a platform, integrating with payment providers, streamlining order fulfillment, to managing customer service) providing customers a plethora of options while ensuring quality. The underlying idea behind a marketplace is to build a community around the common needs of retailers and consumers. 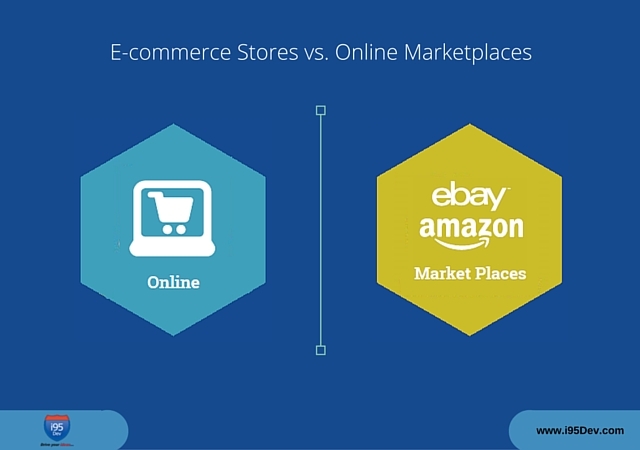 Examples of popular marketplaces include Amazon, eBay, Alibaba and others. Investing either in an e-commerce store or an online marketplace or both requires investments and mandates businesses to evaluate their business strategy while carefully analyzing the pros and cons of both the platforms. To facilitate understanding we have tabulated the pros of cons of both across various categories. Investment (Development Time and Costs) E-commerce stores require more time and budget – while businesses can leverage platforms like Magento to shorten the development cycle it still requires effort in customizing the e-commerce store to your brand. Online marketplaces require little upfront investment and businesses can get started very quickly – usually, all they have to do is register and they are ready to sell. Functionality & Extensibility E-commerce stores are more feature rich and can be further extended to add more functionality. Online marketplaces limit the functionality available to businesses – they usually provide the basic functionality required by businesses to sell effectively. Maintenance E-commerce stores require more maintenance. Online marketplaces require very less maintenance. Customization E-commerce stores can be customized to incorporate any custom requirements or workflows specific to your organization. Online marketplaces usually do not provide the flexibility for customization. They mandate the businesses the use the platform as is. Reach Customer reach in e-commerce stores is usually very limited compared to online marketplaces. Online marketplaces allow you to reach a much wider audience across geographies. Scalability While e-commerce stores can be scaled to meet the growing needs of businesses they require additional investments (invest in an enterprise edition, scale the server, etc.) . Online marketplaces are designed for scalability (as they have to cater to multiple businesses and a relatively larger customer base). SEO With your e-commerce store you will also have to invest a good amount of time optimizing your store for search engines. We often find SEO, for most businesses, to be a tough nut to crack. The popular online marketplaces, over a period of time, have been optimized for search engine. Businesses can quickly take advantage of their popularity with search engines and open the gates to the world of organic traffic. Customer Acquisition Cost The customer acquisition cost is higher for e-commerce stores as you have to invest additional marketing dollars to attract customers to your e-commerce store. The customer acquisition cost is usually lower for online marketplaces because it allows you to leverage the existing large customer base (the costs are spread across multiple businesses). Branding E-commerce stores give you flexibility to control all the aspects of your brand – from your website template, logo, call to action, to customer communication. One of the major disadvantages of online marketplaces is the limited brand visibility. Customers, more often than not associate all their positive (and negative) experiences with the online marketplace and not the brand. Customer Service While businesses can better control the customer experience in e-commerce stores, customer service can be a daunting task for businesses (both small and big) and require significant investments. Online marketplaces usually are very particular about customer experience and have stringent rules in place (mostly in favor of customers) to control that experience. They also invest a lot of their time and money in constantly improving that experience. Businesses can easily offload customer service to online marketplaces or leverage their state of art infrastructure to better control that experience. Flexibility and Control E-commerce stores give businesses better control over what is displayed about their brand. They can decide if and how an information is conveyed. Online marketplaces give businesses very little control. Businesses often have very little say in if and how a positive or negative review about the brand or its product, is displayed. Competition With e-commerce store you make customers go the extra mile to compare your product price with that of competition. On online marketplaces, you are listed alongside a number of other businesses and it is very easy for consumers to compare prices. Margins In e-commerce stores, businesses do not have to share any commission. Online marketplaces charge a commission on every sale made which has an impact on merchant’s profit margin. Data (Customer Insights) In e-commerce store, businesses own the customer data. They can leverage all the data they collect to draw meaningful insights and better target the customers (promotions, offers, emails, cross-sell, up-sell, etc.) Online marketplaces do not share any customer information with businesses that limits how they reach out to the customers. Personalization Personalization is currently the buzz in the world of online commerce. With e-commerce stores, you can leverage all the data on hand and advanced features of the e-commerce store to personalize the product offering and customer experience (custom pricing, etc.). This not only helps in improving conversions but also help build customer loyalty. In the online marketplace, it is a level playing field for all businesses. While the marketplace can personalize the customer experience the benefit is not passed on to the business. Customer Relationship Management With e-commerce stores businesses are in complete of how they manage and nurture the customer relationship. E-commerce stores give them the flexibility to target customers better and increase the customer lifetime value. Because online marketplaces do not share data with businesses, there is no concept of customer relationship management. While online marketplaces can help businesses reach a wider audience the customer lifetime value is limited because businesses cannot retarget them for lack of data. Marketplaces can never replace the e-commerce store, or vice-a-versa, but certainly capable of complementing each other. While online marketplaces can help you quickly reach a wider audience with a smaller investment, e-commerce stores help you build your brand, personalize your offering, and drive customer relationship and experience – which platform to adopt depends on the stage you are in your business? Ideally, you must plan and allocate budget in both directions. For example, consider ProAudioStar, the New York’s leading dealer for DJ, Pro Audio equipment, Music Technology and Instruments. ProAudioStar started by selling both on their e-commerce store and through online marketplace eBay. In the earlier years, because their brand was new, eBay greatly helped them acquire customers and gain visibility. So much so, that eBay at that time used to contribute to the majority of their revenue. But, today the story is very different. While eBay still is a very important sales channel for ProAudioStar, their e-commerce store now contributes to the majority of their revenue. Bottom line, eBay helped ProAudioStar get in front of the customers initially and then their e-commerce store helped them establish a long-term relationship with them. But this was not it, what really helped ProAudioStar stay ahead and leverage these channels effectively was their forethought and decision to integrate eBay, Magento (their e-commerce store), and their ERP system. The integration helped them to take advantage of both e-commerce store and eBay online marketplace by automating order fulfillment workflow and reducing the operational overhead required to maintain these platforms.